Developer SP Setia has partnered with award-winning Fender Katsalidis Architects and renowned garden designer Paul Bangay to unveil Parque, Melbourne’s first inner city residential development located on private parklands. Centrally located at 557 St Kilda Road, Parque will comprise 332 open plan one, two and three-bedroom apartments set on 6,000 square metres of parkland and just minutes from Melbourne’s premier shopping, dining, entertainment and recreation precincts. Parque has been designed to create a living environment that balances the modern design of the sculptural building, with a private garden for residents and sprawling parklands. Each apartment will be open plan, light-filled and come with high quality finishes and appliances. All apartments will feature a private balcony with most looking onto the serene private parklands. Inspired by its Victorian-era setting, Bangay’s goal was to blend the contemporary design of the building with the park’s existing 19th Century features. Layers of greenery, hedging and beds of annual flowering plants aim to create restful spaces, while 200-year-old elm trees are used to line Parque’s boundaries and pay homage to the garden’s past. Parque’s curved glass form allows potential investors to embrace the garden surrounds from every possible vantage point. Luxuries make Parque stand out for potential investors. The building’s 70-metre foyer is styled to be reminiscent of a luxury hotel and offers visitors an immediate view of the Parque grounds upon arrival. A round-the-clock concierge service will provide residents with a personal laundry service and picnic baskets for the use in the park. 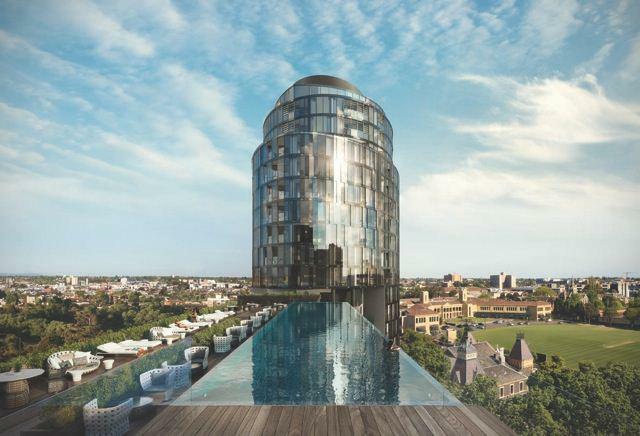 The rooftop of level 8 includes a 25 metre infinity pool, which acts as the showcase of the private outdoor lounge, and offers spectacular views of Melbourne’s skyline from one side, and an outlook of the leafy treetops from the other. Level 11, nicknamed the ‘Parque Club Level’, will include amenities for entertaining guests such as a pergola-covered outdoor BBQ area, massage room and an onyx relaxation room with views of picturesque Albert Park. One-bedroom apartments at Parque range in size from 45 to 58 sqm and prices start from $410,313. One-bedroom apartments with a study range in size from 55 to 65 sqm and are priced from from $530,000. Two-bedroom apartments cover 66 to 80 sqm and start from $669,222. Three-bedroom apartments range from 108 to 134 sqm in size and are priced from $1.3 million. Parque’s penthouse apartment is 205 sqm in size and has a $3.1 million price tag. Construction is expected to commence in mid-2014 and is due for completion in mid-2016. Parque’s display suite will open in late August.